Q: What do you do when there isn't enough room in the greenhouse to start all the seeds you have? A: Start invading the garage! I took a couple strands of Christmas lights (the old incandescent mini lights) and spread them out over the counter. I had some extra marble slabs sitting in the corner doing nothing so I put them to good use and laid them on top of the lights. Not only do they make a nice, flat surface but more importantly, they distribute the heat evenly just like a real (expensive) heat mat. This method works super well and I can actually control the amount of heat since I used three strands of lights. Then, on February 28th, I moved them into the garage when I realized I needed to expand operations. Growing tomatoes in the cool garage with bottom heat means the tomatoes will be encouraged to grow nice, strong roots without the top growth getting too out of hand too quickly. This is how they look right now. The bottom heat provides a constant temperature of about 62 degrees F (16 C). I am experimenting with leaving the lights on 24 hours a day. About 10 of the 30 tomato plants show a bit of yellowing, but they should snap out of it once warmer temperatures arrive. 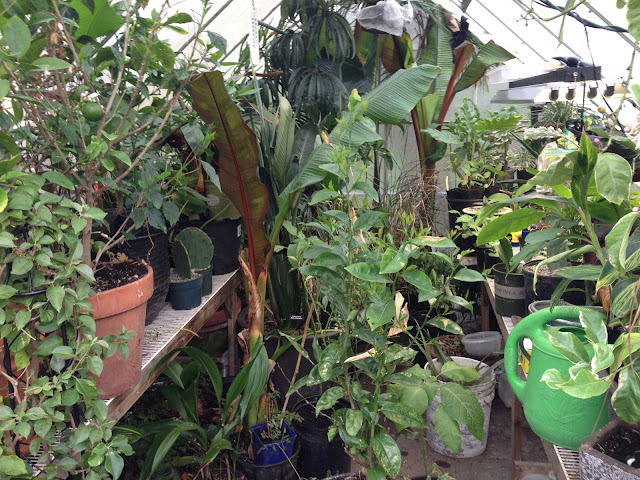 Once May rolls around, I will transport all the subtropical plants from the greenhouse out into the garden and put the tomatoes back in there to soak up as much heat as possible. My goal is to be picking ripe tomatoes by the 4th of July! 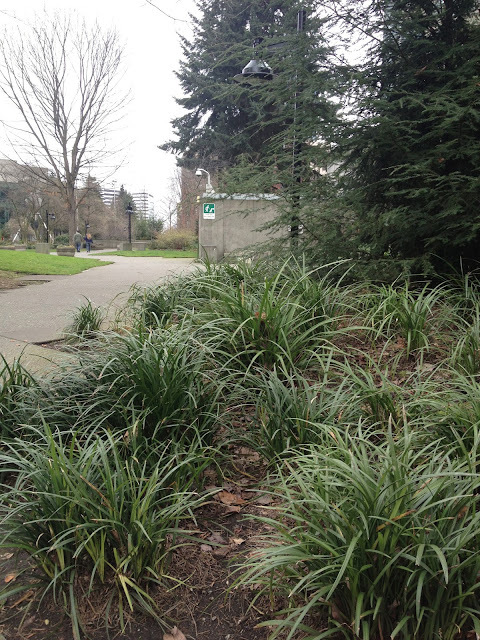 Right in the middle of downtown Seattle, Freeway park is a jungle of plants within a jungle of concrete. It was built in 1976 - and has dutifully reclaimed and reconnected the land that I-5 split apart when the freeway opened in 1967. While walking to the NW Flower & Garden Show a couple weeks ago, some of the newer plantings in the park caught my attention and I stopped to snap a few photos. 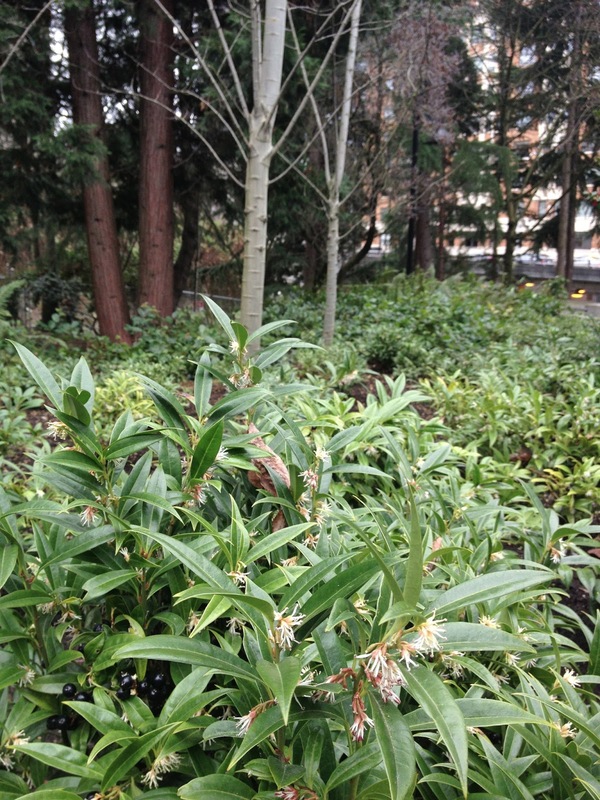 The fragrant Sarcococca humilis enchants the winter air. Especially in such a mass planting. This dual-colored Camellia japonica wasn't actually in Freeway Park, but close enough. The next time you're in downtown Seattle, it's worth checking out! Click here for directions. 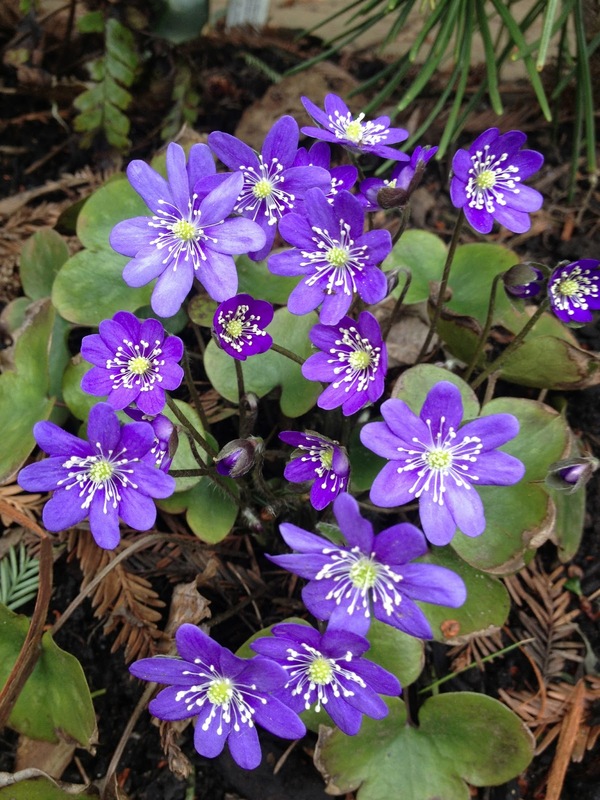 The weather in March and April in Seattle has been known to drive people crazy (well at least one person), but it has been so calm around here lately I think the only people going crazy are the meteorologists. Long-term forecasts are for yet another cooler-than-normal spring, but who pays attention to those? As the days and nights become ever so gradually milder, more and more plants are starting to come to life. Asparagus starting to shoot up. 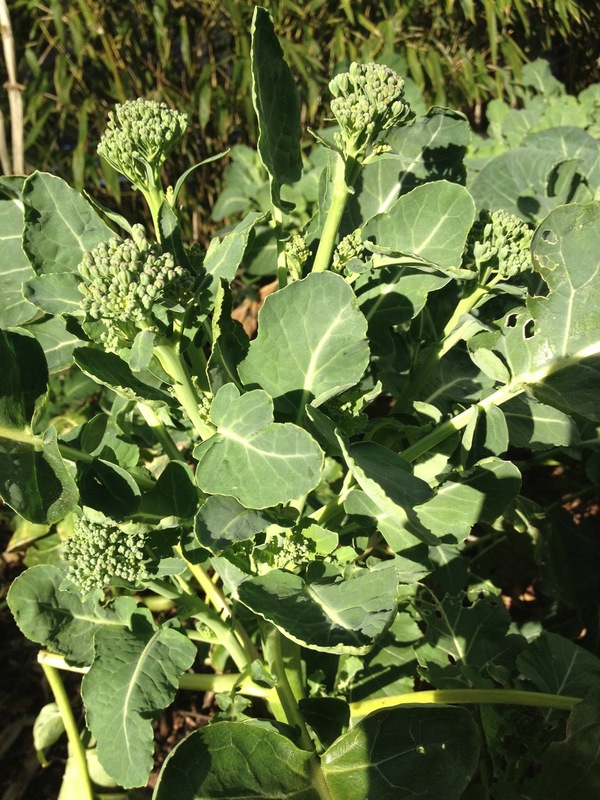 It will be ready for harvest next month. Peas planted two weeks ago on President's Day have emerged from the ground. Vertical gardening is an ancient phenomenon as old as the legend of the hanging gardens of Babylon. Big or small, they can be installed on existing walls or fencing offering additional gardening space. Frenchman Patrick Blanc is one of the worlds leading innovators in vertical gardening. Combined with hydroponics, vertical gardening can be a means of growing food inside cities as is the case with Sky Greens in Singapore. Or they can be used as a bioscreen as part of a process to recycle grey water back into drinking water. This is exactly what happens at the Vertical Forest in Milan, Italy. Cool season crops like mache (Valerianella locusta), fava beans (Vicia faba), and Italian kale (Brassica oleracea 'Nero Di Toscana') do really well for maritime climate folk. They have a lot of staying power in the garden because they like the cold and are harvest-ready throughout the winter. Here's a fun & simple visual soil test: Fill a mason jar half full with soil, add water until 3/4 full, cover, shake it very well until evenly mixed, then let it sit still on the counter for two full days. The sand is the heaviest and will sink to the bottom first, followed by the organic material or silt, and finally the small clay particles will slowly come to rest on the top. You will have three distinct layers that will show you how much of each component is in your soil. 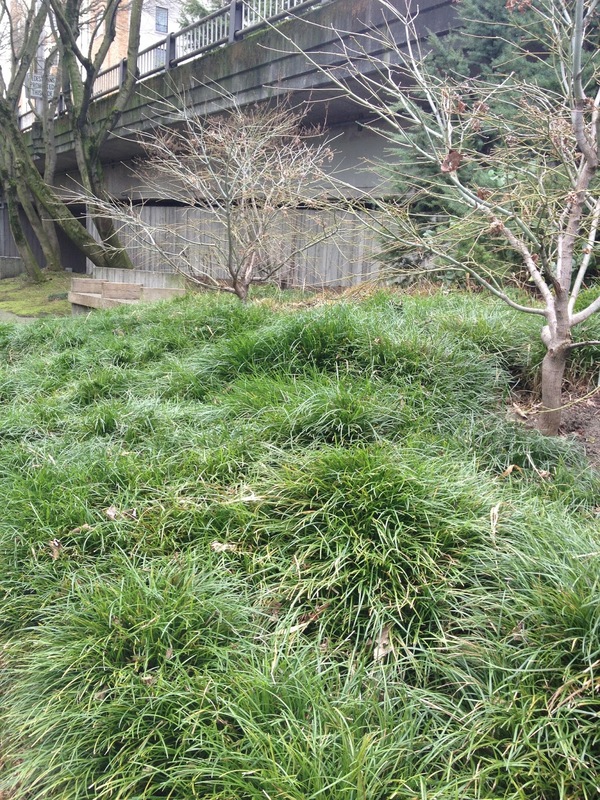 Ms. Forkner lives in West Seattle and is the editor of Pacific Horticulture magazine. Her website is PlantedAtHome.com. Why Grow Divas When You Can Grow Pros? Mr. Keys is the author of Why Grow That When You Can Grow This? 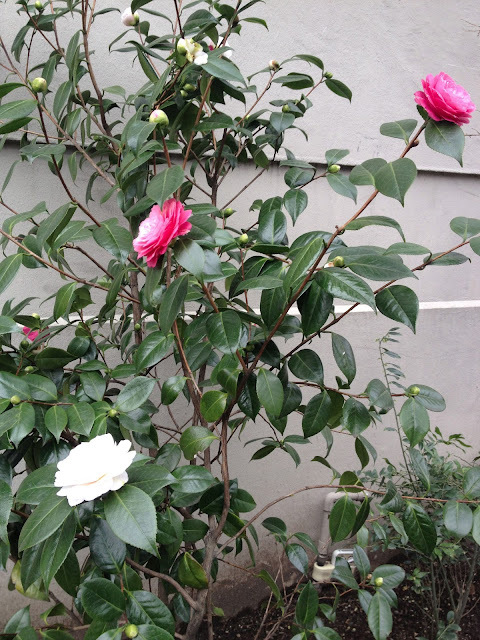 which offers better, usually lesser-known replacements to common problematic plants. The Colorado Blue Spruce (Picea pungens) might do well in Colorado, but here in the NW a better choice would be the Blue Spanish fir (Abies pinsapo 'Glauca') because it will not become infested with aphids. Toward the beginning of his talk he did an amusing comparison between plants and celebrities, advising that sometimes a perfect-looking rose you buy at the nursery will ultimately turn into a drug-addicted diva in the garden. Then again, I heard Lindsay Lohan was getting better. While some comparisons were a bit of a stretch (one of his recommendations was to grow a prickly pear instead of a peony), at the very least his replacement plants remind us to consider the potential problems those high-maintenance plants will likely incur. Mr. Keys' website is GardenSmackdown.com. One of the quintessential birds for much of the country is the hummingbird. Their migration north happens at the same time the flowering currants (Ribes sanguineum) are blooming, and will often establish a home territory at this time and near this plant. Ciscoe also mentioned that, in the event that you find yourself inundated with wildlife, you can officially register your garden as a certified wildlife habitat. Ciscoe does a weekly radio show called Gardening With Ciscoe. You can listen to it here on Saturdays from 10am-12pm (Pacific Time) or download the 97.3 Kiro app on your phone and listen to previously aired episodes. His website is Ciscoe.com. Cornus ‘Eddie's White Wonder’ - Great small dogwood with early white flowers and nice fall foliage. x Chitalpa tashkentensis - Deciduous tree with light pink flower spikes that resemble the shape of an orchid flower. Acer tegmentosum (Snakebark maple) - Japanese maple with striped bark. Does well in the shade. 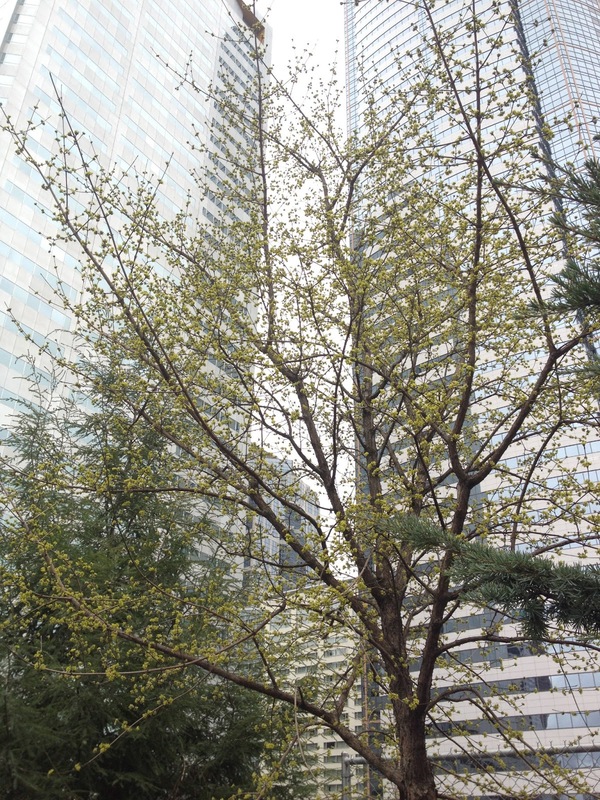 Acer japonicum 'Shindeshojo' - New growth in the spring is an outlandish pink. Acer circinatum 'Pacific Fire' - Coral bark maple that retains bark color for 5-7 years. Catalpa bignonioides 'Aurea' - Yellow-leaved deciduous small tree. Malus 'Adirondack' - Disease resistant crabapple. Prunus laurocerasus 'Mount Vernon' - This is that dwarf English laurel that has been mass-planted along recent road construction projects which is a testament to its durability and well-mannered behavior. Saxifraga 'Primuloides' - Evergreen groundcover that does surprisingly well in shade. Anemone nemorosa - Spring ephemeral displaying white, pink, or purple flowers before dying back in summer. Narcissus 'Thalia' - White is so much better than yellow. Allium karataviense - Flowering onion with purplish-blue foliage. Allium hollandicum ‘Purple Sensation' - Reaches 3' tall and reliably returns year after year. Lilium martagon - I need one of these. Arisaema sikokianum - Early-blooming cobra lily. Trillium sessile - Trillium with very cool mottled leaves. Aster x frikartii - Long period of blue blooms into the fall. Gentiana acaulis - The term "blue" is sometimes used very loosely when describing flowers, but this flower is blue man group blue. Fothergilla gardenii - Fragrant white flowers in spring. Daphne × transatlantica ‘Blafra’ ETERNAL FRAGRANCE - I haven't decided whether I should boycott patented plants or mass produce them and give them away for free. Parthenocissus henryana - Shade vine with red fall color.